We’re so pleased to announce our nomination for “Most Innovative Cybersecurity Company” in the Cybersecurity Excellence Awards. Seems like folks are just as excited as we are about our Moving Target Defense. So what’s all the fuss about? It’s simple, actually. 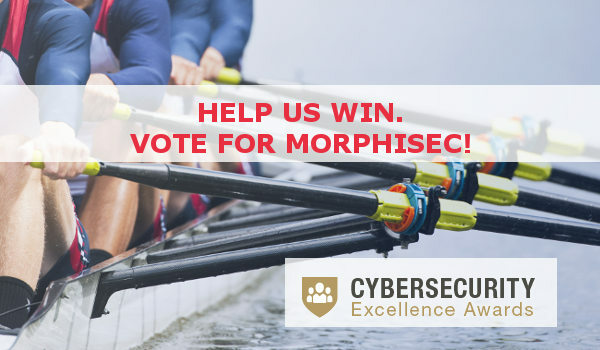 Here are the Top 5 reasons to cast your vote for Morphisec today. We’re in it for you. Morphisec is more than just a product… We’re focused on people! Everything we do is done to help you, your employees and your customers. After all, we are all dedicated individuals who make up the team committed to bringing innovative security solutions to the market. We come in peace. Morphisec solutions work side-by-side with your preinstalled security solutions including antivirus, firewalls and others. You don’t have to change anything or remove anything. Our software won’t disturb the status quo (except for blocking exploits…). No more false positives! You read that right. Morphisec solutions provide advanced security so you can relax and focus on your business goals without being unnecessarily alerted every five minutes. No signatures. No updates. No nonsense. Morphisec’s application-agnostic and attack-agnostic technology can be installed on the fly, without rebooting or updating rules, signatures or databases, and no learning algorithms. Detection is dead! Long live exploit prevention! Morphisec turns the tables on attackers. Instead of security operations chasing after attacks and hackers, attackers now futilely chase after targets that Morphisec makes impossible to locate, identify or penetrate. So what are you waiting for? Click here to cast your vote now!